Can we understand the Bible as a whole? It is great to have you with us at St Augustine’s today. I trust that you are made to feel welcome! Please let any of us know if there is any way our community can support you. Last Sunday I preached on the Parable ofthe Sower from Matthew 13. (You can listen to it again on our website any time www.staugs.church/sermons). Jesus challenged us to be the sort of soil in which his word flourishes. His word to us is more precious to us than we can imagine, because it is the way we grow in faith and confidence in him. It also points to aspects of our lives that he would like us to reevaluate. Repentance should be a normal and regular response to hearing God’s word. However sometimes it is hard to make sense of parts of the Bible. They can be complicated, culturally distant, and sometimes seemingly contradictory. And there are parts of the Bible that can be simply difficult to believe. I think one of the things we struggle with most is understanding the Bible as a whole. It’s almost as if we need a map to help us know where we are, because the bible is an unfolding story, not just a random collection of writings. The events of Genesis form the basis for the events of Exodus, and so on. For this reason, over then next 7 weeks I would like our sermons not just to look at the passages for the day but to start at the very beginning and work our way through the first 11 chapters of the Bible. 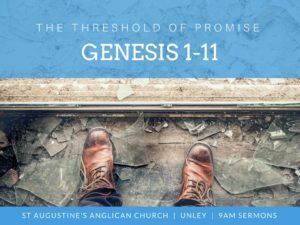 Genesis 1-11 lays the foundation for everything else in the Bible, and helps us to see the arc that actually ties the whole of our Scriptures together. Genesis 1-11 also contain things like the 6 day creation account, Noah and the flood, as well as other things people find difficult to reconcile with modern science. So I would like to address these issues as well and show that we can absolutely depend on the word of God, but we do need to be asking the right questions. One of the other benefits of a structured sermon series is that the topics will line up with the content of the Growth Groups. So if the sermons raise questions, you can go along to the group and think it through in more detail. I am looking forward to opening the Bible at the very first verse with you, commencing next week (30 July). May God enrich us all.